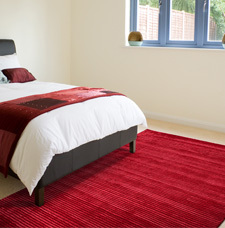 Jubilee is a range of thick and dense handloom wool and viscose rugs. This is a collection of modern solid coloured striped rugs featuring a soft and sumptuous dual pile height where the lower stripes are made of wool while the upper stripes are made of silky smooth viscose. This textured surface creates a soft and luxurious feel underfoot and creates a visually dazzling effect even in solid colours.